Flow Line Controls Filter Regulator is a cost effective way to prevent moisture and dust from entering protected equipment such as actuators, solenoid valves and positioners. 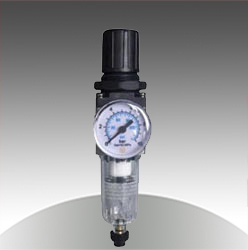 The Filter Regulator maintains air pressure at the set level regardless of variations of both air consumption and source pressure. The automatic drain releases accumulated moisture eliminating the need for manually draining the filter bowl. Flow Line Controls strongly recommends a Filter Regulator be installed at "point of use" with every 3-15 psi and 4-20 mA valve positioner to prevent permanent damage from contaminates and moisture.